On Monday I'll once again teach GS 4300 - Theory & Practice of Translation & Interpretation , a foundation course for the Certificate in Translation Studies of the University College, Denver University (after clicking on the link, scroll down the Global Affairs course page list until you get to the 4300 courses and click on the course title for a brief description of the course). Several years ago I posted my class outlines in this blog. During the next three months I'll once again post periodically about the course, writing about what I'm teaching, my thoughts about the course and on the topics touched during it, what I learn from my students' questions, and what they learn from the course. I'll appreciate any comment you may have on these posts, as they'll help me improve the course as I'm teaching it and for the next time. A deep knowledge of one’s own native language and of at least one foreign language is a necessary prerequisite, but, alone, it is not enough. 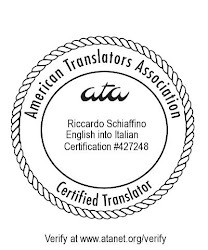 To become a translator one should also fully understand the subject matter of the text to be translated, and have knowledge of things such as translation tools, reference materials, translation processes, and, above all, self knowledge: knowing what one knows as well as an awareness of what one does not know. In your opinion, what are the prerequisites for becoming a translator? Two things I would definitely include high on the list are the ability to write well in one's native language and a personal obsession with quality. Attention to details (as Rob already mentioned above) and never take anything for granted. Even more important: a logical mind. It might be worthwhile to qualify "a deep knowledge" as going rather beyond having learnt both languages as a child. Also important: good critical reading skills. Target language should be native for the translators to give quality translation. I love your introduction paragraph, it actually summarize most of my translation studies classes this year. I might actually quote you in an exam paper, if you give me permission ! I also fully agree with the comments. You can certainly quote me: glad to help! Thanks a lot for the permission. I will cite this link as source as well as your full name and position. I'm sure my professor will be glad of this new addition! I'm far from sure that it is necessary to "fully understand the subject matter of the text to be translated." Most technical texts are written by people with postgrad qualifications: do you have to have the knowledge of a qualified engineer/doctor/whatever to translate in that field? On the contrary, translating accurately basing yourself on the language structure rather than the subject matter is one of the translator's necessary skills, IMHO. One should be always ready to dig through heaps of new information to find just one word, THE one word that fits the phrase best. A translator is a researcher and unlike any other researcher, he or she is not limited to one scientific field. The whole world is the field. Your argument is a bit of a straw-man: it implies that "fully understand the subject matter of the text to be translated" means having the same knowledge as the expert who wrote or developed the original text; in my opinion, instead, it means being able to follow the text and understand it even if not necessarily being able to develop an equivalent text. Let's take as an example of a technical text an advanced book on chess technique written by a Grand Master: does the translator need to be an equally adept chess player as the author to translate it? Obviously, not, o nobody could have translated a book by Tal, Fischer or Kasparov. In fact, the translator probably does not need to be even a very good player, but he or she needs to know chess well at least theoretically; to have read and studied chess books, so as to be familiar with how they develop an argument and to understand what the author is saying. Relying on language knowledge alone can carry the translator only so far. A lack of actual understanding of what is being said in the source text may lead the translator to misrepresent it in the target text. "Deep knowledge in target language." Sorry, Riccardo, I really didn't mean to straw-man you, but that wasn't quite what the "fully" in "fully understand" meant to me. In any case, I see your example and mostly agree with it, except that in the real translation world, our hypothetical chess translator might well not know his gambit from his end-game until he got stuck in and learnt the terminology and register. So I think what really matters is that he can be relied on to approach the task in the right way. I appreciate your content and it's really helpful for me.Thanks for share with us. Just an example of not being a subject matter expert in the topic you are translating. In medicine, there is a difference between "bleeding" and "hemorrhage." Not knowing the medical difference between one and the other, leads not just to inaccurate translation, but may lead to incorrect diagnoses, unnecessary tests, delays in treatment, etc. I have seen these errors in "simplified" patient education websites, translated by who?? Once a text is translated, is there a quality review process? There is a lot of substandard translations online, and so many "translations and localizations" services, with dubious qualifications. Buyer beware.